I wanted to share this quick tutorial today for anyone who is using my print and cut (or just regular cut files) on their Cricut software but only wants to use part of the image. Sometimes you will get a file containing multiple images or motifs and you want to only use certain parts of the file. For example. I have this “Summer” banner printable available, but I also have a version with the full alphabet. IF you were making a custom banner, you wouldn't want to print and cut ALL the letters, only the ones you want to use, so you need to crop them out of the original print and cut file. First you need to open the file in design space (you can follow THIS post if you need help walking through how to get your SVG print and cut files into design space). Now you need to figure out which letters you want.. In this case I’m going to spell the word: “Yum” for my banner. The first thing I need to do it select a shape that will cover the popsicle.. In this case I’m going to use a square. 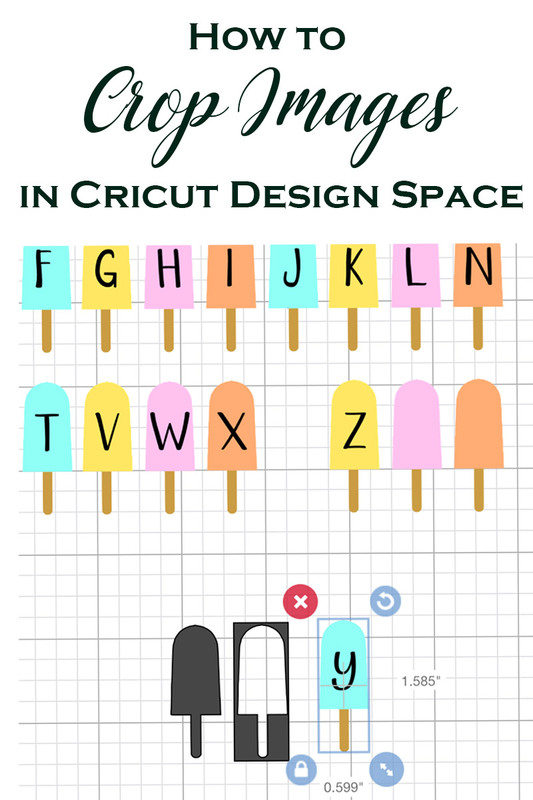 Now I need to select BOTH the square AND the popsicle graphic. When you do this, the slice tool will appear (in the lower right hand corner). If you click “Slice” you will see that BOTH laters will be sliced. The square AND the popsicle. Now this file is ready to be cut just like any other! Easy right?